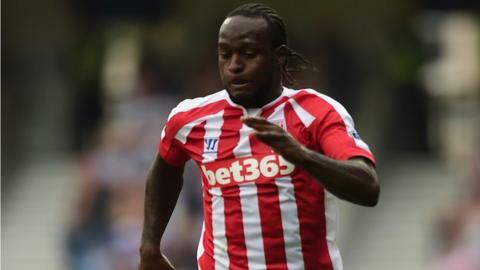 Nigeria forward Victor Moses will miss this month's Africa Cup of Nations qualifiers against Sudan after a recurrence of a thigh injury. The 23-year-old was forced off after only 18 minutes of Stoke's 3-1 defeat at Sunderland on Saturday. Nigeria caretaker coach Stephen Keshi has called up Dolphins striker Emem Eduok as a replacement. Stoke boss Mark Hughes said Moses will be sent for "more tests during the international break". The new injury setback will come as a big blow for Moses, who has not played for the Super Eagles since the second round 2-0 loss to France at the World Cup in Brazil. Out-of-contract Nigeria coach Keshi overlooked Moses for the shock 3-2 home defeat to Congo and the goalless draw in South Africa last month, saying the player was off form. But he brought him back as Nigeria aim to recover from a poor start to qualifying for Morocco that has left them third in Group A, with only the top two teams guaranteed a place at the finals. It places extra pressure on the African champions to win their match away to Sudan, which will take place on 11 October, and the return fixture four days later in Abuja. Moses' replacement Eduok played a bit-part role in Nigeria's Flying Eagles' campaign at the 2013 World Youth Championship held in Turkey last year. He will join up with the camp in Abuja, where the home-based players gathered on Sunday. Nigeria's foreign-based stars are expected in camp from Monday.